Microsoft has entered into a partnership with iFixit, the online repair manual site, to boost the reuse market for smartphones, tablets and laptops. Over the past year the two companies have been developing and testing a free online training programme – the Pro tech Network – to help start-ups and small enterprises who wish to offer repair services for these products get off the ground. Featherstone is development manager of the London Re-Use Network. This year, in case you hadn’t heard, he shot up 67 places to 29th in the “Hot 100”, the list of the biggest cheeses in waste management according to Resource magazine. Even so, 29th looks like scant acknowledgement of the fact that, by linking many different charities who collect, repair and sell unwanted items, and connecting them to a single disposal Hotline number (and website), the LRN has shown for the first time how reuse can create jobs (44 so far in the LRN), reduce waste, and really, seriously work. Until recently, your local authority had neither the resources, nor the reason to push reuse. How were they going to mend your washing machine or sell your sofa? Gradually, however, European and domestic legislation has raised both the cost of landfill, now taxed at £80/tonne, and recycling targets. (Only determined lobbying got reuse included as part of “recycling”, or else councils would have been effectively penalised for supporting it.) As a result, for councils at any rate, not re-using began to become the bigger hassle. And so, in 2009, after much badgering, the Greater London Authority finally included reuse in their waste strategy. At the time, among those charities that measured it, 4,000 tonnes of goods were being reused around the city each year. In 2010, the LWaRB ( London Waste and Recycling Board) awarded £4.3m to set up the LRN, which gathered those charities together into a tighter unit that would now collect, mend and sell pretty much all furniture, household appliances, electronic goods, bicycles and paint. The network has evolved to the point that residents of eight participating boroughs just have to contact the Re-Use hotline or website to have their stuff removed from their home for the same price as a council bulky waste collection (generally around £20). Today the rate is 12,000 tonnes, and the only thing keeping it from rising faster is the shortage of vans. Reusers from Birmingham have been in touch to find out how they can develop a network of their own, and ideas are being swapped with the energetic and forward-thinking Zero Waste Scotland. Links are also being formed with some of the smaller groups working independently around the country. “We have interest from all over the place,” Featherstone says, and you can see why. This, pretty clearly, is how it’s done. I meet Featherstone one sunny morning at one of the links in the chain at Smugglers Way waste transfer station in Wandsworth. Here, alongside the usual public recycling bays, is a new area devoted to collecting items for reuse. Behind the scenes, with the help of Groundwork, the LRN has also fitted out Re-Work, essentially two sheds – one with a designer and her team, who rebuild and respray furniture to make it valuable again, the other with engineers trained in mending cookers, fridges, dryers, washing machines and dishwashers. A row of machines, all white, shrink-wrapped and guaranteed for a year, sits outside on the Tarmac, waiting to be taken away in the next charity van. Often, Re-Work’s manager Keith Perdicou tells me, there is very little mending needed. 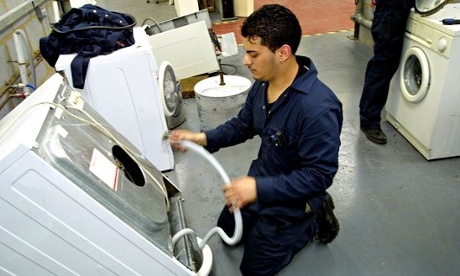 “We get washing machines in, and the first thing the boys do is take the filter out. They’ll find there’s five pence stuck in the water pump. There are several different things like that. Probably 50% of the machines that come through we put down as ‘no fault’.” Featherstone reckons 25%, but they basically agree: it’s plenty. Even when a repair is needed, it is often simple. Replacing the switch on the door, that’s a common one, or even just cleaning out the rubber seal. (They get mouldy after months without hot washes or biological powder.) Indeed it is Featherstone’s dream that Re-Work might soon form a partnership with a manufacturer, through which they would exchange what their engineers learn about appliances in the real world for the sponsorship of another engineer. What was once a few guys tinkering with a few machines in scattered sheds is now a professional outfit that sends out around 80 mended appliances each week. It could easily, they believe, be more. In West12 shopping centre, in Shepherd’s Bush, west London, customers are prowling around the floor of a huge shop, eyeing attractively presented tables and chairs, clean sofas, or a neat row of fridges and washing machines, much as they might in DFS or Dixons. This is the end of the reuse cycle – and also the beginning. The shop was opened last February by Furnish, a charity affiliated with the LRN who collect, distribute and sell reused appliances and furniture. 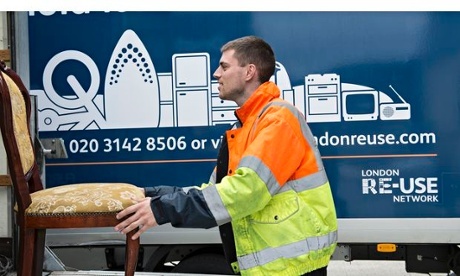 Most items come through the Re-Use Hotline, some from Re-Work, and some through the dealer-takeback scheme, in which retailers remove old items from people’s houses when they deliver new ones. It is the biggest reuse shop in London and, so far as anybody here knows, the biggest in Britain. The prices here really are unbeatable, and there are still deeper discounts for customers who receive benefits. They can buy a good double bed with a new mattress for about £100, a reconditioned Bosch washing machine for just £150, or something less illustrious for £80. “If it’s nice, things they go really quickly,” says Andrea Feller, the store manager. Although in truth most things go soon enough, and there’s a high turnover of stock. “There’s always new bits every day,” she says, “usually around a van full”. There’s not the salesman sparkle about Furnish that you might find in a conventional high-street showroom. Nor the chutzpah of Petit Miracles, the upcycling store upstairs. Yet it is dignified and practical, and very much a showroom. Part of the philosophy here is that people need to pay a small amount for their goods in order to take pleasure in owning them, and thus feel like taking care of them too. Charles Craft, who is managing director of London Re-Use, remembers a 22-year-old woman visiting Furnish with a £180 voucher from her housing association. She bought a washing machine and a fridge, and even had enough left over for a table and chairs, but afterwards was found crying. “She had never dreamed in her life she’d be able to sit at a dining table and have a meal,” Craft says afterwards, back out among the crowds. “It’s great to engage in political forums and with boroughs, but when you actually see people benefiting …” I lose his words among the hubbub. Out of the Dark: our video about the small organisation bringing discarded furniture back to life. Correction: an earlier version of this article said that the funding for the LRN had come from the GLA. This has now been corrected: the source of the funding was the LWaRB ( London Waste and Recycling Board). Last year, our TEDx talk raised the question of how to move towards a people-centred circular economy. This question is more relevant than ever. Recently, we contributed to the Environmental Audit Committee’s ongoing inquiry on Growing a Circular Economy – our evidence follows below. Thanks to researcher Lara Houston for turning our concerns and ideas into this document. The Restart Project is a London-based social enterprise, registered as a Charitable Incorporated Organisation, that encourages and empowers people to use their electronics and household electricals longer, by learning repair and maintenance skills. Our community events create engaging opportunities to increase the lifespan of Electronic and Electrical Equipment (EEE). 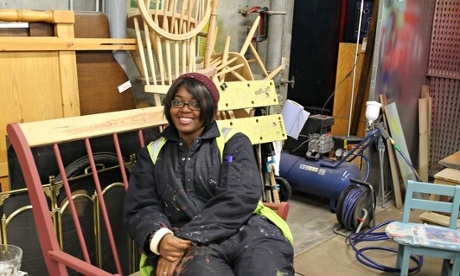 At our regular ‘Restart Parties’ in the London boroughs of Camden, Hackney and Lambeth, participants undertake guided self-repair of EEE, transforming broken objects back into working ones, and diverting these from waste streams. 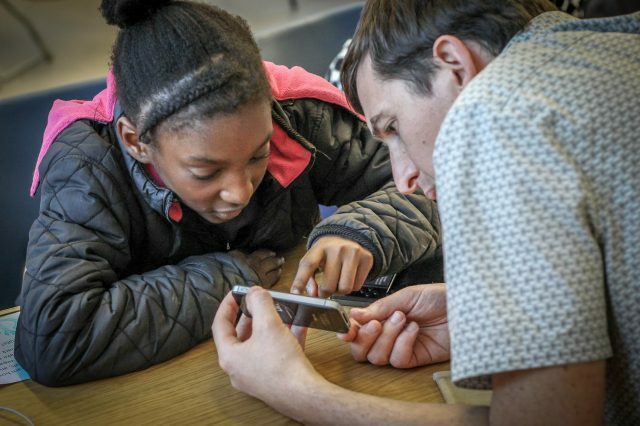 We have diverted over 750kg of electronics from waste in 55 events since 2012, and we are supporting groups across the UK to replicate our community work. Our work also includes a wider strand of repair activism and advocacy. We lecture on design, repair and resilience: educating designers-in-training, persuading organisations and engaging the public in the benefits of re-use. It is clear to us that the linear modes of consumption based on a ‘take-make-dispose pattern’ are not working. The high levels of waste generated in this paradigm of consumption have egregious social and environmental impacts, widely documented elsewhere. 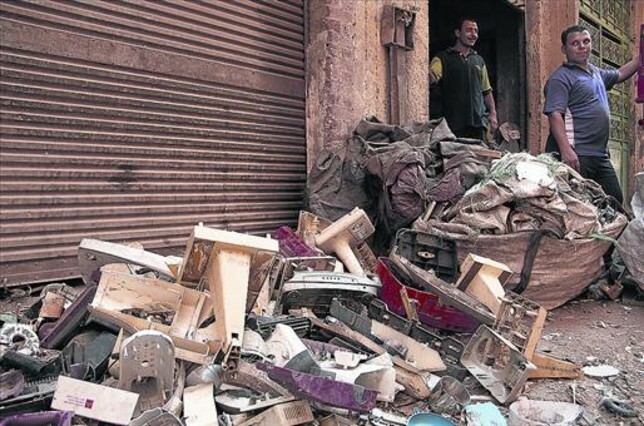 Although preferable to other modes of disposal, recycling is energy-intensive and cannot be the only or simple ‘solution’ to the e-waste ‘problem’. We support the more holistic framework provided by the circular economy, which emphasises the conservation and re-use of resources throughout multiple product life cycles. In the context of this consultation, our experience and expertise can contribute to two particular aspects of the circular economy: the ‘power of circling longer,’ which refers to the maximisation of the lifetime of products through multiple cycles, and the local, efficient ‘inner circle,’ in which repair and re-use unleash the value of products currently designated as waste. Individuals that attend our repair events often describe to us the barriers of entry they face to repairing broken EEE. Most obviously, they are unsure how to access reliable repair services. This concern has two components. Firstly, consumers struggle to find clear and accessible information on repair services in their local areas. Secondly, there is a question around trust in these services: how to repair, (or have an object repaired) in a reliable environment, and in an affordable way. 3.2 / There are some extremely straightforward recommendations that we can make to improve the situation for consumers. As the statutory collectors of household waste, local authorities could and should play a much larger role in the provision of information about pathways to repair. They primarily promote recycling to residents as part of their waste management strategies. This reflects the bias of the WEEE Directive (which despite a recent recast has failed to incorporate requirements to increase re-use) and the EU Waste Framework Directive. Moving towards a circular economy perspective would require local authorities to prioritise re-use and repair as a core part of their waste strategies. They could take on a key role in communicating the message to residents that re-use and repair must come before recycling or other forms of disposal. Local authorities could augment the information they provide on recycling and waste disposal to include in-depth information on the opportunities for re-use and repair within the local area. 3.3 / Concrete actions we would like to see happening now include: updating borough council printed and online communications to include details of local repair businesses, re-use charities and social enterprises, community re-distribution services such as Freecycle and Freegle, local and online second-hand markets, and community repair groups such as ours. We understand that in the current climate of resource cuts that civil society organisations must come on board as partners in this enterprise. We are particularly keen that information on local repair infrastructures generated by local councils be available as geo-coded data licensed as open. Groups such as The Restart Project could leverage this data in a wide variety of different ways, helping to add value to the work undertaken by local authorities. For example, other groups or companies could build review platforms for these repair enterprises, helping to establish the trusted networks that consumers are so keen to see. This kind of promotional activity helps to bring residents into contact with their local ecosystem of repair services. It works to sustain these important local businesses, but also strengthens local economic development more widely. 3.4 / The recycling centres operated by local authorities and their contractors are extremely important locations for enabling re-use and repair. 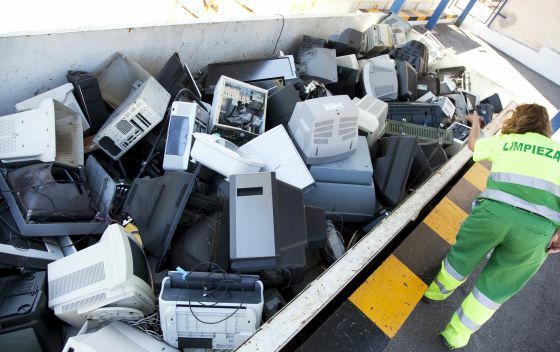 Currently, WRAP estimates that as much as 23% of WEEE disposed of at recycling centres has the potential to be repaired3. The re-use of WEEE has the potential to save the taxpayer of £1.9 million on goods with a resale value of £231.5 million4. Local authorities must resist categorising all the goods that come to their recycling centres as waste, and deal in a more contextual way with equipment that is functional but unwanted, or broken but repairable. As a bare minimum, local authorities and their contractors should signpost residents towards repair services at these sites. But we feel that they could adopt a more active approach. WEEE suitable for re-use or repair could be identified and directed towards local re-use and repair organisations for refurbishment and re-distribution. Local authorities could even partner with these organisations and provide them with much needed space for repair activities. The cost of renting space is particularly onerous for charitable and social enterprises and local authorities would also therefore be contributing to their sustainability. In return, these organisations deliver direct savings to the council by diverting these items from the waste stream and provide social benefits through the dissemination of repair skills and refurbished EEE. The Community RePaint network is an example of one such scheme in action. As we have previously observed, cost is a factor in deterring consumers from repairing broken EEE. Skilled labour is expensive, and processes of manufacturing may mitigate these costs through particular forms of organising or outsourcing, in ways not currently practical for after-sales servicing. Again, we welcome the more holistic re-imagining integral to the circular economy discussion, where both the design of devices, and the structuring of relations between consumer and company are organised in ways that reduce the costs of repair. Companies should certainly be incentivised to create new workflows that include production and after-sales repair. However, we believe that there are steps that central government could take to encourage repair in the independent sector now. Given the social and environmental benefits of repair, plus the direct savings to local authorities through the diversion of materials from the waste stream, we suggest that repair services should not be subject to Value Added Tax (VAT) in order to make repairing more attractive and to allow the sector to survive and thrive. 4.2 / The European Environmental Bureau (EEB) report Advancing Resource Efficiency in Europe (2014) recognises the role that re-use can play in job creation. They estimate that a modest increase in recycling and reuse rates to 55% would create an additional 634,769 jobs by 2025. These evaluations only include figures for furniture and textile re-use, and it is likely that the repair of higher value EEE streams would contribute more jobs. In their report Routes to Re-Use (2014) the Local Government Authority (LGA) suggests a cut to National Insurance Contributions (NICs) for additional staff in repair organisations would assist in the expansion of the repair sector. This suggestion that will increase the viability of both non-profit and profit-making enterprises, and encourage innovative new organisations within this area, and we endorse it. 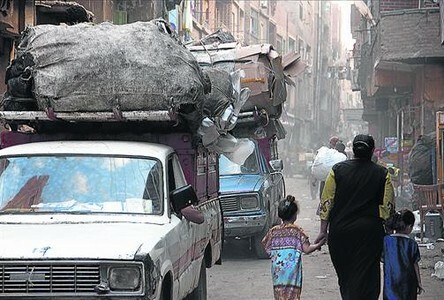 A las afueras de El Cairo, la revolución digital ha llegado a la ‘ciudad de la basura’, donde sus habitantes se dedican a recoger desechos: los escolares toman clases de informática e impulsan empresas competitivas, y un grupo de mujeres aprenden a manipular y reconstruir ordenadores asequibles para los vecinos. Los hombres se dedican a la recolección de residuos, y las mujeres y los niños los reciclan. Todos los miembros de la famila colaboran desde pequeños en la recolección y clasificación de la basura. 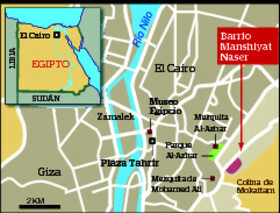 En el barrio de Manshiyat Naser se reciclan gran parte de los desechos de El Cairo. Un vaho caliente, espeso y dulzón inunda las calles y penetra las fosas nasales con un hedor nauseabundo. Es el vapor putrefacto que emana de la descomposición de los desechos de la ciudad. 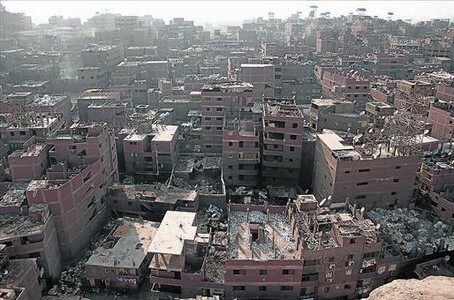 La basura de El Cairo tapiza el suelo, cubre los edificios y desborda las azoteas de Manshiyat Naser, la ciudad de la basura. Allí, en el último piso de un edificio maltrecho de la calle principal, vive Moussa Nazmy, un chico de 21 años cuya vida gira entorno a la basura, al igual que la de los 60.000 habitantes de este asentamiento, ubicado en la base de la colina Mokattam, a las afueras de la ciudad. Un barrio donde los hombres se dedican a recorrer las calles a pie o en carro recolectando basura, mientras las mujeres y los niños clasifican las inagotables pilas de residuos que inundan su ciudad. «Durante un año enseñé a reciclar botellas de champú», explica Moussa, exalumno y profesor de la Escuela de Reciclaje de la asociación Spirit of Youth, dedicada a educar y prover de trabajo a los niños. Debido a que empresas fantasma utilizaban envases de champú de marcas reconocidas para vender sus productos, los grandes fabricantes empezaron a pagar a la escuela por la recogida de sus envases. Las botellas recuperadas por los niños eran destruidas y el polvo de plástico vendido a los recicladores. Estos niños no son como el resto de los cairotas. 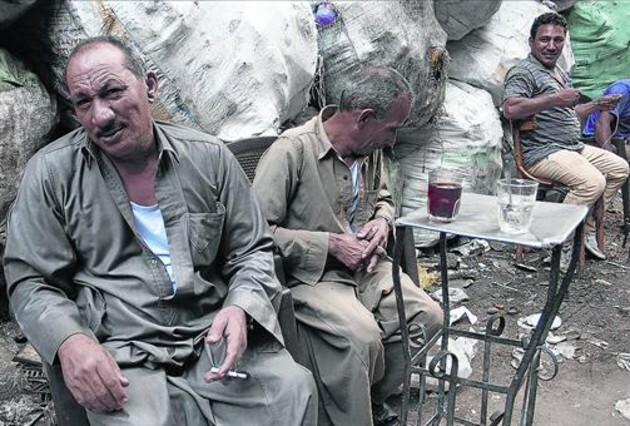 Son jóvenes zabbaleen, como se conoce a la comunidad de cristianos coptos que desde hace más de 50 años se dedican a la recolección de la basura de El Cairo. Una comunidad que ha sido estigmatizada por el resto de los egipcios por su fe cristiana y su forma de ganarse la vida. «La gente nos ve como si no fuéramos buenos trabajadores -explica Moussa con cierto resentimiento-. Pero estamos trabajando para limpiar la basura que ellos dejan, y eso nos hace buenas personas». Alrededor de una mesa redonda, tres niños de unos 6 años juegan a las cartas con Laila Zaghloui, la directora de la escuela, mientras otro grupo de chicos se amontonan entorno a los ordenadores del laboratorio de informática. «Aquí les damos educación socio-ambiental para que desarrollen su oficio», afirma la directora. De hecho, el objetivo de la escuela, fundada en el 2004, es preparar a los futuros recicladores suministrándoles experiencia laboral, conocimientos medioambientales, educación básica y alfabetización informática. «Aquí les enseñamos a trabajar digitalmente, y eso es muy útil para su futuro», explica Mary Mofes, la profesora de informática, que también pertenece a la comunidad zabbaleen. Durante las clases, los 191 alumnos que tiene la escuela aprenden programas de manejo de mapas y localización geográfica, y analizan las diferentes zonas de la ciudad. A pesar de la corta experiencia, la directora afirma que el proyecto está dando buenos resultados, ya que «la mayoría de los graduados están creando empresas de reciclaje más modernas y competitivas». La actividad económica en la ciudad de la basura, sin embargo, sigue siendo informal, y las infraestructuras básicas como el agua corriente, el alcantarillado o la electricidad siguen teniendo grandes carencias. Pero los zabbaleen, que en árabe significa gente de la basura, no siempre se han dedicado a la recolección. Originalmente los coptos habitaban el Alto Nilo y se dedicaban a la crianza de cerdos, hasta que las inclemencias climáticas en las décadas de 1930 y 1940 les obligaron a emigrar a la ciudad, donde empezaron a trabajar en la recolección de papel y cartón. 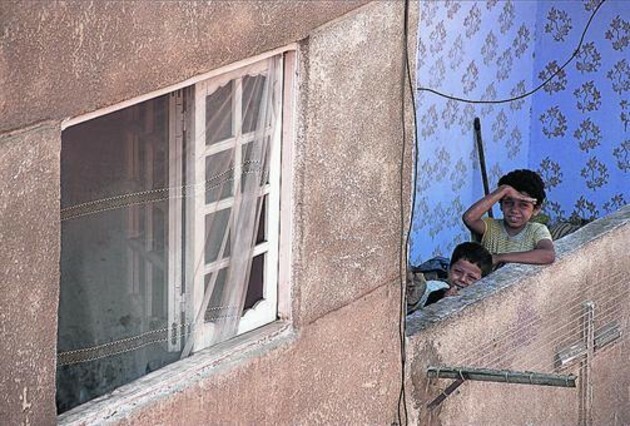 Más tarde, en los años 70, las familias asentadas en la zona de Imbaba fueron desalojadas, y la mayoría se estableció en las canteras abandonadas al pie de las colinas Mokattam, a las afueras de El Cairo, donde continuaron subsistiendo de la basura. En el 2003, sin embargo, el Gobierno otorgó la recolección de la basura a empresas privadas, cosa que empeoró aún más la situación económica de la comunidad. «Cuando las empresas extranjeras se hicieron cargo del negocio, los recolectores perdieron gran parte del trabajo», explica Ezzat Naem Guindy, el director de Spirit of Youth, la oenegé creada en el 2004 por un grupo de jóvenes con el fin de capacitar a desocupados y reintegrarlos en el mercado laboral. A pesar de que actualmente las empresas privadas se encuentran inactivas, con la privatización se perdieron miles de puestos de trabajo, y los jóvenes y, sobre todo, las mujeres fueron los más desfavorecidos. Por ello, en el 2009 la oenegé, en colaboración con CID, una consultoría especializada en emprendimientos sociales, y la operadora de telefonía móvil Mobinil, crearon el Proyecto de Reciclaje de Residuos Electrónicos con el fin de reinsertar laboralmente a mujeres jóvenes a través de la recuperación de ordenadores y el reciclaje de basura electrónica. Al final de un callejón atiborrado de basura y recostada contra una roca de la colina de Mokattam, en cuya cima se levanta la Iglesia de San Simón, la más grande de Oriente Próximo, se encuentra la sede de Spirit of Youth. Allí tres veces por semana unas 20 chicas trabajan junto a un ingeniero desmantelando los equipos, comprobando el estado de las piezas, clasificando y reensamblando los nuevos ordenadores, explica Ezzat. Luego se instala el software de Microsoft, cuya licencia la oenegé ha obtenido a muy bajo coste, y finalmente los residuos son vendidos a los recolectores, y los ordenadores, a los vecinos. El dinero recaudado se distribuye a medias entre las operarias y la asociación. «Con precios baratos fomentamos que los zabbaleen utilicen las nuevas tecnologías», afirma Ezzat. Efectivamente, a pesar de la pequeña escala del proyecto, la oenegé ha propiciado que los vecinos accedan a un ordenador, algo impensable hasta el momento. Sin embargo, esta organización no solo vende ordenadores a la mitad del precio del mercado, sino que hace donaciones a la Iglesia y a organizaciones como la Escuela de Reciclaje donde estudió Mousa. El gran esfuerzo de estas jóvenes por reducir la brecha digital en su comunidad, sin embargo, se ve entorpecido por la falta donaciones, uno de los mayores problemas para seguir acercando la tecnología a los zabbaleen. Por lo tanto, las mujeres aprovechan las largas horas de ocio para aprender informática con ordenadores recuperados por sus propias manos. Porque, además de contar con un dispositivo, hay que saber usarlo. «En mi casa tenía un ordenador, pero ni lo tocaba», afirma Soad Kamel, una operaria de 33 años. «Sin embargo, ahora he empezado a utilizar algunos programas». En el taller del Proyecto de Reciclaje de Residuos Electrónicos, además de reconstruir ordenadores y estudiar informática, las jóvenes también aprenden a manipular los componentes peligrosos de los aparatos para separarlos de forma segura y enviarlos al vertedero de El Nasserya, al oeste de Alejandría. La reducción del impacto ambiental de los desechos electrónicos es otro de los objetivos de Spirit of Youth, ya que, al igual que el resto del planeta, Egipto aumenta año tras año su basura digital. Según estadísticas del Ministerio de Comunicaciones y Tecnología de la Información, en el 2013 el 44% de los hogares contaba con un ordenador y había 100 millones de móviles en circulación. Pero más allá de la producción local, el aspecto que más preocupa son los residuos extranjeros vertidos en el país. Se estima que la generación de basura electrónica mundial crece a alrededor de 40 millones de toneladas al año, y «no parece que el mundo tenga la intención de ser más responsable», afirma Leila Iskander, directora de la consultora CID hasta principios del 2014 y actual ministra de Medio Ambiente. «Por ello la llegada de residuos electrónicos y su manejo es un aspecto fundamental». La manipulación y el contacto con elementos contaminantes de los desechos electrónicos, como el mercurio, el plomo o el cadmio, pueden causar enfermedades cerebrales en el sistema nervioso o causar infertilidad, además de generar graves daños ambientales. Sin embargo, a pesar de que el Convenio de Basilea prohíbe desde el 2011 exportar desechos peligrosos a países pobres, según un informe de la Organización Internacional del Trabajo del 2012 Egipto es uno de los destinos del desecho electrónico mundial. Los desechos electrónicos representan una amenaza para los países en vías de desarrollo. Pero más allá de los perjuicios, también ofrecen ciertos beneficios económicos. La abundancia de metales como acero, cobre, aluminio, oro o platino en los dispositivos en desuso se ha convertido en los últimos años en un medio de subsistencia de recolectores que se dedican a clasificar estos metales para venderlos a operadores mayoristas. Sin embargo, si bien el reciclaje ha abierto una nueva oportunidad, hay otro problema que tiene que ver con el precio en el mercado internacional. «Las directivas de la UE no se aplican a las empresas y a los precios que estas pagan en el sur, solo se regula lo que hacen en Europa», explica Leila Iskander desde su moderna oficina con vistas al Nilo. A pesar de las dificultades, en el 2009 un grupo de jóvenes cairotas crearon RecycloBekia, la primera empresa de reciclaje de desechos electrónicos de Oriente Próximo. En un barrio del sur, donde la ciudad empieza a diluirse en el desierto, está la factoría de la empresa. Allí trabajan un pequeño grupo de operarios que cada mes recuperan unas 20 toneladas de metales tras descuartizar miles de ordenadores, impresoras y otros artilugios en desuso. «Ser la primera empresa tiene ventajas, como no tener competidores», explica Mostafa Henmdan, el joven director de RecycloBekia, que sacó la inspiración de un documental de National Geographic. «Pero también hay desventajas, como la falta de experiencia o de un marco legal». El reciclaje de la basura digital se divide en cuatro etapas. Sin embargo, la empresa se limita a la recolección, el desmantelamiento y la clasificación, ya que el refinamiento para recuperar los metales es un proceso costoso que se realiza en unos cuantos países desarrollados. Pero a pesar de esta y otras tantas dificultades a la que se enfrentan día a día, esta incipiente empresa ya empieza a hacerse un nombre en el mercado. Como dice Mostafa: «No estamos construyendo una empresa. Estamos estableciendo la industria». Si bien RecycloBekia lleva dos años reciclando basura digital, aún no ha pasado el tiempo suficiente para saber si la empresa es exitosa o no, afirma Sherif Issa, jefe de Salud y Medio Ambiente de Mobinil, la operadora de móvil que colaboró en la creación de Spirit of Youth. Pero más allá de su éxito, tarde o temprano, tanto en países desarrollados como en emergentes, de forma industrial o artesanal, la basura digital deberá ser tratada, y los gobiernos deben adoptar una actitud responsable. «Hasta hace un año no había ninguna cultura de reciclaje aquí en Egipto», explica Nahla El-Shamy, la responsable de relaciones públicas de RecycloBekia, desde la oficina de la empresa. Y para seguir difundiendo esta nueva cultura, esta egipcia perteneciente a una nueva generación de emprendedores espera que el Gobierno se implique más y les ayude a difundir la cultura del reciclaje. No solo para evitar enfermedades y daños medioambientales, sino para desarrollar la economía verde y crear puestos de trabajo para los egipcios.